Illustration of mucus-secreting epithelial cells. Researchers interested in the mechanisms of epithelial transport in the cystic fibrosis (CF) field have been hampered by the lack of animal models that faithfully recapitulate the defects seen in human CF airways. Sun et al. (page 3149) use the recently developed ferret model of CF and Lee and Foskett (page 3137) and Joo et al. (page 3161) use the recently developed pig CF model to investigate the mechanisms underlying the defective airway mucus transport. Citation Information: J Clin Invest. 2010;120(9):3003-3003. https://doi.org/10.1172/JCI44640. Citation Information: J Clin Invest. 2010;120(9):3004-3004. https://doi.org/10.1172/JCI44633. Citation Information: J Clin Invest. 2010;120(9):3005-3005. https://doi.org/10.1172/JCI44594. Citation Information: J Clin Invest. 2010;120(9):3006-3006. https://doi.org/10.1172/JCI44542. Citation Information: J Clin Invest. 2010;120(9):3008-3011. https://doi.org/10.1172/JCI44158. Vision research has often led to significant advances in our understanding of biology. There has also been particular success in translating basic research in the eye into breakthrough clinical therapies that mark important milestones for ophthalmology and also for medical research. Anti-VEGF therapy for age-related macular degeneration was named as one of the top ten science advancements of the year 2006. Only two years later, successful transfer of the RPE65 gene into retinal pigment epithelium of patients with Leber congenital amaurosis was noted as one of the most important clinical applications of gene therapy. The articles in this Review series outline current developments in vision research and highlight its continued importance in ophthalmology and medicine. Citation Information: J Clin Invest. 2010;120(9):3033-3041. https://doi.org/10.1172/JCI42437. Age-related macular disease (AMD) accounts for more than 50% of blind registration in Western society. Patients with AMD are classified as having early disease, in which visual function is well preserved, or late disease, in which central vision is lost. Until recently, there was no therapy available by which the course of the disorder could be modified. Now, the most common form of late-stage AMD — choroidal neovascularization — responds to treatment with anti-VEGF therapies; although visual loss is modified in a portion of these cases, no therapeutic approach exists that alters the evolution from early to late disease. However, as discussed in this Review, research over the last few years has demonstrated several features of AMD that are likely to be amenable to treatment. Potential targets for treatment are described, and possible therapeutic approaches are discussed. Citation Information: J Clin Invest. 2010;120(9):3042-3053. https://doi.org/10.1172/JCI42258. Nonsyndromic recessive retinal dystrophies cause severe visual impairment due to the death of photoreceptor and retinal pigment epithelium cells. These diseases until recently have been considered to be incurable. Molecular genetic studies in the last two decades have revealed the underlying molecular causes in approximately two-thirds of patients. The mammalian eye has been at the forefront of therapeutic trials based on gene augmentation in humans with an early-onset nonsyndromic recessive retinal dystrophy due to mutations in the retinal pigment epithelium–specific protein 65kDa (RPE65) gene. Tremendous challenges still lie ahead to extrapolate these studies to other retinal disease–causing genes, as human gene augmentation studies require testing in animal models for each individual gene and sufficiently large patient cohorts for clinical trials remain to be identified through cost-effective mutation screening protocols. Citation Information: J Clin Invest. 2010;120(9):3073-3083. https://doi.org/10.1172/JCI42440. Autoimmune and inflammatory uveitis are a group of potentially blinding intraocular inflammatory diseases that arise without a known infectious trigger and are often associated with immunological responses to unique retinal proteins. In the United States, about 10% of the cases of severe visual handicap are attributed to this group of disorders. As I discuss here, experimental models of ocular autoimmunity targeting retinal proteins have brought about a better understanding of the basic immunological mechanisms involved in the pathogenesis of uveitis and are serving as templates for the development of novel therapies. Citation Information: J Clin Invest. 2010;120(9):3084-3087. https://doi.org/10.1172/JCI44266. Recombinant activated protein C (aPC) improves the survival of patients with severe sepsis, but the precise molecular and cellular targets through which it mediates this effect remain incompletely understood. In this issue of the JCI, Kerschen et al. show that endothelial cell protein C receptor (EPCR) is specifically expressed by mouse CD8+ dendritic cells and that these coordinators of host responses to systemic infection are required for aPC to provide protection against the lethality of sepsis. An additional study, by Cao and colleagues, recently published in the JCI, implicates the leukocyte integrin CD11b in the pathways by which aPC mediates antiinflammatory effects in the context of lethal sepsis in mice, suggesting a common thread of synergistic control of innate immune responses by life-saving aPC therapy. Citation Information: J Clin Invest. 2010;120(9):3087-3090. https://doi.org/10.1172/JCI44402. Microbes transmitted to mammals by arthropods contend with many factors that could impede survival. To survive, host fitness with infection must outweigh costs. In this issue of the JCI, Neelakanta et al. demonstrate that ticks infected with Anaplasma phagocytophilum show enhanced fitness against freezing injury owing to induced expression of tick “antifreeze glycoprotein.” This allows A. phagocytophilum to successfully propagate and survive to cause disease in nonnatural hosts, such as humans. How an intracellular microbe with a small genome subverts host cell function for survival provides insight into the control of some cellular function programs and underscores how vector biology can have an impact on human health. Citation Information: J Clin Invest. 2010;120(9):3090-3093. https://doi.org/10.1172/JCI44091. Posttranscriptional regulation is of critical importance during mammalian spermiogenesis. A set of mRNAs that encode proteins critical to normal sperm formation are synthesized early in the process of male germ cell differentiation and are stored in a repressed state. These mRNAs are subsequently translationally activated during the process of spermatid elongation and maturation. Of note, the translationally repressed mRNAs contain long poly(A) tails that are dramatically shortened during the translational activation process. Understanding the mechanisms that underlie this process of mRNA storage and subsequent translational activation has been a long-standing goal. The relationship of the poly(A) tail to translational control is intimately related to the functions of the cognate poly(A)-binding proteins (PABPs). In this issue of the JCI, Yanagiya and colleagues use a set of knockout mice to demonstrate a novel functional role for a particular modulator of PABP function, PABP-interacting protein 2a (PAIP2A), in the normal terminal differentiation of male germ cells. Citation Information: J Clin Invest. 2010;120(9):3093-3096. https://doi.org/10.1172/JCI44235. Cystic fibrosis (CF) is caused by defects in the CFTR, a cAMP-activated Cl– channel of epithelia. The resulting reduction in epithelial fluid transport creates abnormally viscous secretions from airway mucous glands that may be a major factor in CF pathology. Mouse airways have few mucous glands, and the mouse model of CF exhibits no significant airway disease. Pigs and ferrets, however, have approximately the same number of airway mucous glands as humans. 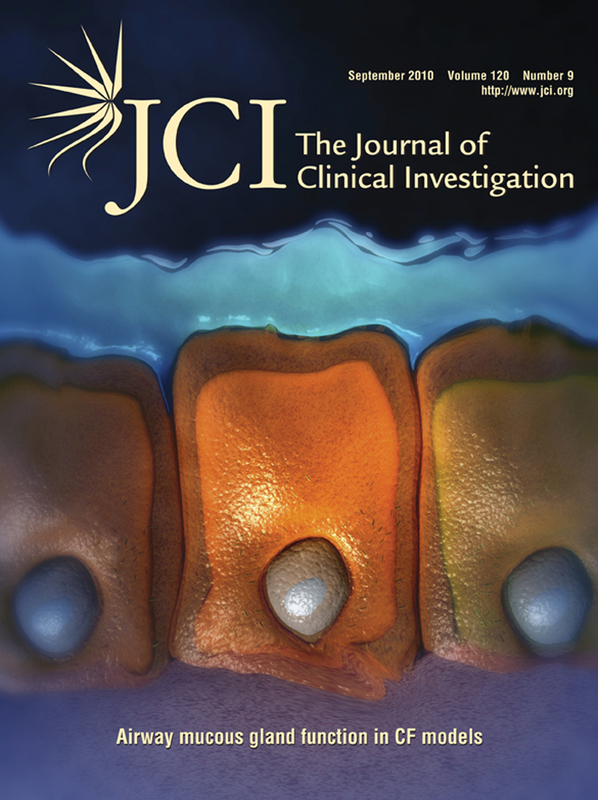 In this issue of the JCI, three independent research groups conclude that changes in airway mucous gland function in CFTR-deficient animals of these species resemble the changes seen in human CF. It is expected, therefore, that these animals will develop lung disease similar to human CF and prove to be valuable models on which to test potential therapies. Citation Information: J Clin Invest. 2010;120(9):3096-3098. https://doi.org/10.1172/JCI43575. Traumatic spinal cord injury is one of the most common causes of disability in young adults. Restoring independent ambulation in such patients is considered one of the biggest challenges in regenerative medicine because repair of spinal cord injury involves the complex processes of axonal regeneration, remyelination, and formation of new synaptic connections. In this issue of the JCI, Abematsu et al. report their attempts to rise to this challenge, showing in a mouse model of severe spinal cord injury that spinal neuronal circuits can be restored by neural stem cell transplantation, leading to impressive functional recovery in the hind limbs. Citation Information: J Clin Invest. 2010;120(9):3099-3102. https://doi.org/10.1172/JCI44312. The appearance of methicillin-resistant Staphylococcus aureus (MRSA) as an endemic microbe, first in hospital and health care settings and more recently in the community, has led to a disastrous situation in which use of the available antibiotic armamentarium is increasingly ineffective and spawns further antibiotic resistance. This vicious cycle highlights the pressing need for an S. aureus vaccine. However, to date, clinical trials with S. aureus vaccines have not demonstrated sustained efficacy. In this issue of the JCI, Skurnik and colleagues report that specific antibodies to two different S. aureus surface polysaccharides, which independently promote effector cell killing of S. aureus in vitro and protection against S. aureus in animal models, bind to and abrogate the activity of one another when they are combined. This fascinating finding suggests a new paradigm to explain the failure of antibody immunity to S. aureus. Citation Information: J Clin Invest. 2010;120(9):3102-3105. https://doi.org/10.1172/JCI44422. The discovery several years ago that fibroblasts and other somatic cells from mice and humans can be reprogrammed to become inducible pluripotent stem (iPS) cells has created enthusiasm for their potential applications in regenerative medicine and for modeling human diseases. Two independent studies in this issue of the JCI provide evidence that iPS cells represent a promising source of hepatocytes for a wide range of applications, including cell transplantation, drug toxicity testing, patient-specific disease modeling, and even ex vivo gene therapy. But how far have we come? Citation Information: J Clin Invest. 2010;120(9):3106-3119. https://doi.org/10.1172/JCI43565. shRNA overexpression from viral gene therapy vectors can trigger cytotoxicity leading to organ failure and lethality in mice and rats. This process likely involves saturation of endogenous cellular RNAi factors including exportin-5 (Xpo-5). Here, we have shown that Xpo-5 overexpression enhanced shRNA efficiency in the liver of adult mice but increased hepatotoxicity. We identified the 4 members of the human Argonaute (Ago) protein family as downstream factors involved in saturation of endogenous cellular RNAi, all of which were able to interact with shRNAs in cells and mice. In Ago/shRNA coexpression studies, Ago-2 (Slicer) was the primary rate-limiting determinant of both in vitro and in vivo RNAi efficacy, toxicity, and persistence. In adult mice, vector-based Ago-2/Xpo-5 coexpression enhanced U6-driven shRNA silencing of exogenous and endogenous hepatic targets, reduced hepatotoxicity, and extended RNAi stability by more than 3 months. Use of weaker RNA polymerase III promoters to minimize shRNA expression likewise alleviated in vivo toxicity and permitted greater than 95% persistent knockdown of hepatitis B virus and other transgenes in mouse liver for more than 1 year. Our studies substantiate that abundant small RNAs can overload the endogenous RNAi pathway and reveal possible strategies for reducing hepatotoxicity of short- and long-term clinical gene silencing in humans. Citation Information: J Clin Invest. 2010;120(9):3120-3126. https://doi.org/10.1172/JCI43267. The ability to generate induced pluripotent stem (iPS) cells from a patient’s somatic cells has provided a foundation for organ regeneration without the need for immune suppression. However, it has not been established that the differentiated progeny of iPS cells can effectively reverse failure of a vital organ. Here, we examined whether iPS cell–derived hepatocytes have both the functional and proliferative capabilities needed for liver regeneration in mice with fumarylacetoacetate hydrolase deficiency. To avoid biases resulting from random genomic integration, we used iPS cells generated without viruses. To exclude compensation by hepatocytes not derived from iPS cells, we generated chimeric mice in which all hepatocytes were iPS cell derived. In vivo analyses showed that iPS cells were intrinsically able to differentiate into fully mature hepatocytes that provided full liver function. The iPS cell–derived hepatocytes also replicated the unique proliferative capabilities of normal hepatocytes and were able to regenerate the liver after transplantation and two-thirds partial hepatectomy. Thus, our results establish the feasibility of using iPS cells generated in a clinically acceptable fashion for rapid and stable liver regeneration. Citation Information: J Clin Invest. 2010;120(9):3127-3136. https://doi.org/10.1172/JCI43122. Human induced pluripotent stem (iPS) cells hold great promise for advancements in developmental biology, cell-based therapy, and modeling of human disease. Here, we examined the use of human iPS cells for modeling inherited metabolic disorders of the liver. Dermal fibroblasts from patients with various inherited metabolic diseases of the liver were used to generate a library of patient-specific human iPS cell lines. Each line was differentiated into hepatocytes using what we believe to be a novel 3-step differentiation protocol in chemically defined conditions. The resulting cells exhibited properties of mature hepatocytes, such as albumin secretion and cytochrome P450 metabolism. Moreover, cells generated from patients with 3 of the inherited metabolic conditions studied in further detail (α1-antitrypsin deficiency, familial hypercholesterolemia, and glycogen storage disease type 1a) were found to recapitulate key pathological features of the diseases affecting the patients from which they were derived, such as aggregation of misfolded α1-antitrypsin in the endoplasmic reticulum, deficient LDL receptor–mediated cholesterol uptake, and elevated lipid and glycogen accumulation. Therefore, we report a simple and effective platform for hepatocyte generation from patient-specific human iPS cells. These patient-derived hepatocytes demonstrate that it is possible to model diseases whose phenotypes are caused by pathological dysregulation of key processes within adult cells. Citation Information: J Clin Invest. 2010;120(9):3137-3148. https://doi.org/10.1172/JCI42992. Cystic fibrosis (CF), which is caused by mutations in CFTR, affects many tissues, including the lung. Submucosal gland serous acinar cells are primary sites of fluid secretion and CFTR expression in the lung. Absence of CFTR in these cells may contribute to CF lung pathogenesis by disrupting fluid secretion. Here, we have isolated primary serous acinar cells from wild-type and CFTR–/– pigs and humans without CF to investigate the cellular mechanisms and regulation of fluid secretion by optical imaging. Porcine and human serous cells secrete fluid in response to vasoactive intestinal polypeptide (VIP) and other agents that raise intracellular cAMP levels; here, we have demonstrated that this requires CFTR and a cAMP-dependent rise in intracellular Ca2+ concentration ([Ca2+]i). Importantly, cAMP induced the release of Ca2+ from InsP3-sensitive Ca2+ stores also responsive to cAMP-independent agonists such as cholinergic, histaminergic, and purinergic agonists that stimulate CFTR-independent fluid secretion. This provides two types of synergism that strongly potentiated cAMP-mediated fluid secretion but differed in their CFTR dependencies. First, CFTR-dependent secretion was strongly potentiated by low VIP and carbachol concentrations that individually were unable to stimulate secretion. Second, higher VIP concentrations more strongly potentiated the [Ca2+]i responses, enabling ineffectual levels of cholinergic stimulation to strongly activate CFTR-independent fluid secretion. These results identify important molecular mechanisms of cAMP-dependent secretion, including a requirement for Ca2+ signaling, and suggest new therapeutic approaches to correct defective submucosal gland secretion in CF. Citation Information: J Clin Invest. 2010;120(9):3149-3160. https://doi.org/10.1172/JCI43052. Citation Information: J Clin Invest. 2010;120(9):3161-3166. https://doi.org/10.1172/JCI43466. Cystic fibrosis (CF) results from mutations that disrupt CF transmembrane conductance regulator (CFTR), an anion channel found mainly in apical membranes of epithelial cells. CF leads to chronic infection of the airways with normally innocuous bacteria and fungi. Hypotheses to explain the pathophysiology of CF airways have been difficult to test because mouse models of CF do not develop human-like airway disease. The recent production of pigs lacking CFTR and pigs expressing the most common CF-causing CFTR mutant, ΔF508, provide another model that might help clarify the pathophysiology of CF airway disease. Here, we studied individual submucosal glands from 1-day-old piglets in situ in explanted tracheas, using optical methods to monitor mucus secretion rates from multiple glands in parallel. Secretion rates from control piglets (WT and CFTR+/–) and piglets with CF-like disease (CFTR–/– and CFTR–/ΔF508) were measured under 5 conditions: unstimulated (to determine basal secretion), stimulated with forskolin, stimulated with carbachol, stimulated with substance P, and, as a test for synergy, stimulated with forskolin and a low concentration of carbachol. Glands from piglets with CF-like disease responded qualitatively to all agonists like glands from human patients with CF, producing virtually no fluid in response to stimulation with forskolin and substantially less in response to all other agonists except carbachol. These data are a step toward determining whether gland secretory defects contribute to CF airway disease. Citation Information: J Clin Invest. 2010;120(9):3167-3178. https://doi.org/10.1172/JCI42629. Activated protein C (aPC) therapy reduces mortality in adult patients with severe sepsis. In mouse endotoxemia and sepsis models, mortality reduction requires the cell signaling function of aPC, mediated through protease-activated receptor–1 (PAR1) and endothelial protein C receptor (EPCR; also known as Procr). Candidate cellular targets of aPC include vascular endothelial cells and leukocytes. Here, we show that expression of EPCR and PAR1 on hematopoietic cells is required in mice for an aPC variant that mediates full cell signaling activity but only minimal anticoagulant function (5A-aPC) to reduce the mortality of endotoxemia. Expression of EPCR in mature murine immune cells was limited to a subset of CD8+ conventional dendritic cells. Adoptive transfer of splenic CD11chiPDCA-1– dendritic cells from wild-type mice into animals with hematopoietic EPCR deficiency restored the therapeutic efficacy of aPC, whereas transfer of EPCR-deficient CD11chi dendritic cells or wild-type CD11chi dendritic cells depleted of EPCR+ cells did not. In addition, 5A-aPC inhibited the inflammatory response of conventional dendritic cells independent of EPCR and suppressed IFN-γ production by natural killer–like dendritic cells. These data reveal an essential role for EPCR and PAR1 on hematopoietic cells, identify EPCR-expressing dendritic immune cells as a critical target of aPC therapy, and document EPCR-independent antiinflammatory effects of aPC on innate immune cells. Citation Information: J Clin Invest. 2010;120(9):3179-3190. https://doi.org/10.1172/JCI42868. In the United States, Ixodes scapularis ticks overwinter in the Northeast and Upper Midwest and transmit the agent of human granulocytic anaplasmosis, Anaplasma phagocytophilum, among other pathogens. We now show that the presence of A. phagocytophilum in I. scapularis ticks increases their ability to survive in the cold. We identified an I. scapularis antifreeze glycoprotein, designated IAFGP, and demonstrated via RNAi knockdown studies the importance of IAFGP for the survival of I. scapularis ticks in a cold environment. Transfection studies also show that IAFGP increased the viability of yeast cells subjected to cold temperature. Remarkably, A. phagocytophilum induced the expression of iafgp, thereby increasing the cold tolerance and survival of I. scapularis. These data define a molecular basis for symbiosis between a human pathogenic bacterium and its arthropod vector and delineate what we believe to be a new pathway that may be targeted to alter the life cycle of this microbe and its invertebrate host. Citation Information: J Clin Invest. 2010;120(9):3191-3208. https://doi.org/10.1172/JCI42955. Human cytomegalovirus (HCMV) in clinical material cannot replicate efficiently in vitro until it has adapted by mutation. Consequently, wild-type HCMV differ fundamentally from the passaged strains used for research. To generate a genetically intact source of HCMV, we cloned strain Merlin into a self-excising BAC. The Merlin BAC clone had mutations in the RL13 gene and UL128 locus that were acquired during limited replication in vitro prior to cloning. The complete wild-type HCMV gene complement was reconstructed by reference to the original clinical sample. Characterization of viruses generated from repaired BACs revealed that RL13 efficiently repressed HCMV replication in multiple cell types; moreover, RL13 mutants rapidly and reproducibly emerged in transfectants. Virus also acquired mutations in genes UL128, UL130, or UL131A, which inhibited virus growth specifically in fibroblast cells in wild-type form. We further report that RL13 encodes a highly glycosylated virion envelope protein and thus has the potential to modulate tropism. To overcome rapid emergence of mutations in genetically intact HCMV, we developed a system in which RL13 and UL131A were conditionally repressed during virus propagation. This technological advance now permits studies to be undertaken with a clonal, characterized HCMV strain containing the complete wild-type gene complement and promises to enhance the clinical relevance of fundamental research on HCMV. Citation Information: J Clin Invest. 2010;120(9):3209-3219. https://doi.org/10.1172/JCI40034. Antineutrophil cytoplasmic autoantibody (ANCA) causes vascular injury that leads to small-vessel vasculitis. Patients with ANCA aberrantly express neutrophil granule–encoding genes, including 2 that encode autoantigens: proteinase 3 (PR3) and myeloperoxidase (MPO). To uncover a potential transcriptional regulatory mechanism for PR3 and MPO disrupted in patients with ANCA vasculitis, we examined the PR3 and MPO loci in neutrophils from ANCA patients and healthy control individuals for epigenetic modifications associated with gene silencing. We found that levels of the chromatin modification H3K27me3, which is associated with gene silencing, were depleted at PR3 and MPO loci in ANCA patients compared with healthy controls. Interestingly, in both patients and controls, DNA was unmethylated at a CpG island in PR3, whereas in healthy controls, DNA was methylated at a CpG island in MPO. Consistent with decreased levels of H3K27me3, JMJD3, the demethylase specific for H3K27me3, was preferentially expressed in ANCA patients versus healthy controls. In addition, we describe a mechanism for recruiting the H3K27 methyltransferase enhancer of zeste homolog 2 (EZH2) to PR3 and MPO loci mediated by RUNX3. RUNX3 message was decreased in patients compared with healthy controls, and may also be under epigenetic control. DNA methylation was increased at the RUNX3 promoter in ANCA patients. These data indicate that epigenetic modifications associated with gene silencing are perturbed at ANCA autoantigen–encoding genes, potentially contributing to inappropriate expression of PR3 and MPO in ANCA patients. Citation Information: J Clin Invest. 2010;120(9):3220-3233. https://doi.org/10.1172/JCI42748. New prophylactic approaches are needed to control infection with the Gram-positive bacterium Staphylococcus aureus, which is a major cause of nosocomial and community-acquired infections. To develop these, greater understanding of protective immunity against S. aureus infection is needed. Human immunity to extracellular Gram-positive bacterial pathogens is primarily mediated by opsonic killing (OPK) via antibodies specific for surface polysaccharides. S. aureus expresses two such antigens, capsular polysaccharide (CP) and poly-N-acetyl glucosamine (PNAG). Here, we have shown that immunization-induced polyclonal animal antisera and monoclonal antibodies specific for either CP or PNAG antigens have excellent in vitro OPK activity in human blood but that when mixed together they show potent interference in OPK activity. In addition, reductions in antibody binding to the bacterial surface, complement deposition, and passive protection were seen in two mouse models of S. aureus infection. Electron microscopy, isothermal calorimetry, and surface plasmon resonance indicated that antibodies to CP and PNAG bound together via an apparent idiotype–anti-idiotype interaction. This interaction was also found in sera from humans with S. aureus bacteremia. These findings suggest that the lack of effective immunity to S. aureus infections in humans could be due, in part, to interference in OPK when antibodies to CP and PNAG antigens are both present. This information could be used to better design S. aureus vaccine components. Citation Information: J Clin Invest. 2010;120(9):3234-3241. https://doi.org/10.1172/JCI42672. Citation Information: J Clin Invest. 2010;120(9):3242-3254. https://doi.org/10.1172/JCI42388. Allergic bronchopulmonary aspergillosis (ABPA) is caused by a dominant Th2 immune response to antigens derived from the opportunistic mold Aspergillus, most commonly Aspergillus fumigatus. It occurs in 4%–15% of patients with cystic fibrosis (CF); however, not all patients with CF infected with A. fumigatus develop ABPA. Therefore, we compared cohorts of A. fumigatus–colonized CF patients with and without ABPA to identify factors mediating tolerance versus sensitization. We found that the costimulatory molecule OX40 ligand (OX40L) was critical in driving Th2 responses to A. fumigatus in peripheral CD4+ T cells isolated from patients with ABPA. In contrast, CD4+ T cells from the non-ABPA cohort did not mount enhanced Th2 responses in vitro and contained a higher frequency of TGF-β–expressing regulatory T cells. Heightened Th2 reactivity in the ABPA cohort correlated with lower mean serum vitamin D levels. Further, in vitro addition of 1,25 OH-vitamin D3 substantially reduced DC expression of OX40L and increased DC expression of TGF-β. This in vitro treatment also resulted in increased Treg TGF-β expression and reduced Th2 responses by CD4+ T cells from patients with ABPA. These data provide rationale for a therapeutic trial of vitamin D to prevent or treat ABPA in patients with CF. Citation Information: J Clin Invest. 2010;120(9):3255-3266. https://doi.org/10.1172/JCI42957. The body’s capacity to restore damaged neural networks in the injured CNS is severely limited. Although various treatment regimens can partially alleviate spinal cord injury (SCI), the mechanisms responsible for symptomatic improvement remain elusive. Here, using a mouse model of SCI, we have shown that transplantation of neural stem cells (NSCs) together with administration of valproic acid (VPA), a known antiepileptic and histone deacetylase inhibitor, dramatically enhanced the restoration of hind limb function. VPA treatment promoted the differentiation of transplanted NSCs into neurons rather than glial cells. Transsynaptic anterograde corticospinal tract tracing revealed that transplant-derived neurons reconstructed broken neuronal circuits, and electron microscopic analysis revealed that the transplant-derived neurons both received and sent synaptic connections to endogenous neurons. Ablation of the transplanted cells abolished the recovery of hind limb motor function, confirming that NSC transplantation directly contributed to restored motor function. These findings raise the possibility that epigenetic status in transplanted NSCs can be manipulated to provide effective treatment for SCI. Citation Information: J Clin Invest. 2010;120(9):3267-3279. https://doi.org/10.1172/JCI41348. Hypertension is an underlying risk factor for cardiovascular disease. Despite this, its pathogenesis remains unknown in most cases. Recently, the transient receptor potential (TRP) channel family was associated with the development of several cardiovascular diseases linked to hypertension. The melastatin TRP channels TRPM4 and TRPM5 have distinct properties within the TRP channel family: they form nonselective cation channels activated by intracellular calcium ions. Here we report the identification of TRPM4 proteins in endothelial cells, heart, kidney, and chromaffin cells from the adrenal gland, suggesting that they have a role in the cardiovascular system. Consistent with this hypothesis, Trpm4 gene deletion in mice altered long-term regulation of blood pressure toward hypertensive levels. No changes in locomotor activity, renin-angiotensin system function, electrolyte and fluid balance, vascular contractility, and cardiac contractility under basal conditions were observed. By contrast, inhibition of ganglionic transmission with either hexamethonium or prazosin abolished the difference in blood pressure between Trpm4–/– and wild-type mice. Strikingly, plasma epinephrine concentration as well as urinary excretion of catecholamine metabolites were substantially elevated in Trpm4–/– mice. In freshly isolated chromaffin cells, lack of TRPM4 was shown to cause markedly more acetylcholine-induced exocytotic release events, while neither cytosolic calcium concentration, size, nor density of vesicles were different. We therefore conclude that TRPM4 proteins limit catecholamine release from chromaffin cells and that this contributes to increased sympathetic tone and hypertension. Citation Information: J Clin Invest. 2010;120(9):3280-3295. https://doi.org/10.1172/JCI42856. Deregulated production of IL-17 and IL-21 plays a key pathogenic role in many autoimmune disorders. A delineation of the mechanisms that underlie the inappropriate synthesis of IL-17 and IL-21 in autoimmune diseases can thus provide important insights into potential therapies for these disorders. Here we have shown that the serine-threonine kinase Rho-associated, coiled-coil–containing protein kinase 2 (ROCK2) becomes activated in mouse T cells under Th17 skewing conditions and phosphorylates interferon regulatory factor 4 (IRF4), a transcription factor that is absolutely required for the production of IL-17 and IL-21. We furthermore demonstrated that ROCK2-mediated phosphorylation of IRF4 regulated the synthesis of IL-17 and IL-21 and the differentiation of Th17 cells. Whereas CD4+ T cells from WT mice activated ROCK2 physiologically under Th17 conditions, CD4+ T cells from 2 different mouse models of spontaneous autoimmunity aberrantly activated ROCK2 under neutral conditions. Moreover, administration of ROCK inhibitors ameliorated the deregulated production of IL-17 and IL-21 and the inflammatory and autoantibody responses observed in these autoimmune mice. Our findings thus uncover a crucial link among ROCK2, IRF4, and the production of IL-17 and IL-21 and support the idea that selective inhibition of ROCK2 could represent an important therapeutic regimen for the treatment of autoimmune disorders. Citation Information: J Clin Invest. 2010;120(9):3296-3309. https://doi.org/10.1172/JCI41490. Breast cancer is a highly heterogeneous disease, with several different subtypes being characterized by distinct histology, gene expression patterns, and genetic alterations. The tumor suppressor gene retinoblastoma 1 (RB1) is frequently lost in both luminal-B and triple-negative tumor (TNT; i.e., estrogen receptor–, progesterone receptor–, and human epidermal growth factor receptor 2–negative) breast cancer subtypes. However, a causal role for RB1 loss in different subtypes remains undefined. Here we report that deletion of Rb alone or together with its relative p107 in mouse mammary stem/bipotent progenitor cells induced focal acinar hyperplasia with squamous metaplasia. These lesions progressed into histologically diverse, transplantable mammary tumors with features of either luminal-B or TNT subtypes. The TNTs included basal-like tumors as well as tumors that exhibited epithelial-to-mesenchymal transition (EMT). The EMT-type tumors and a subset of the basal-like tumors, but not luminal-B–like tumors, expressed mutant forms of the tumor suppressor p53. Accordingly, targeted deletion of both Rb and p53 in stem/bipotent progenitors led to histologically uniform, aggressive, EMT-type tumors. Reintroduction of Rb into these tumor cells suppressed growth in vitro and tumor formation in vivo. These results establish a causal role for Rb loss in breast cancer in mice and demonstrate that cooperating oncogenic events, such as mutations in p53, dictate tumor subtype after Rb inactivation. Citation Information: J Clin Invest. 2010;120(9):3310-3325. https://doi.org/10.1172/JCI42391. Some cancers have been stratified into subclasses based on their unique involvement of specific signaling pathways. The mapping of human cancer genomes is revealing a vast number of somatic alterations; however, the identification of clinically relevant molecular tumor subclasses and their respective driver genes presents challenges. This information is key to developing more targeted and personalized cancer therapies. Here, we generate a new mouse model of genomically unstable osteosarcoma (OSA) that phenocopies the human disease. Integrative oncogenomics pinpointed cAMP-dependent protein kinase type I, α regulatory subunit (Prkar1a) gene deletions at 11qE1 as a recurrent genetic trait for a molecularly distinct subclass of mouse OSA featuring RANKL overexpression. Using mouse genetics, we established that Prkar1a is a bone tumor suppressor gene capable of directing subclass development and driving RANKL overexpression during OSA tumorigenesis. Finally, we uncovered evidence for a PRKAR1A-low subset of human OSA with distinct clinical behavior. Thus, tumor subclasses develop in mice and can potentially provide information toward the molecular stratification of human cancers. Citation Information: J Clin Invest. 2010;120(9):3326-3339. https://doi.org/10.1172/JCI42550. Cancer stem cells (CSCs) are generally dormant or slowly cycling tumor cells that have the ability to reconstitute tumors. They are thought to be involved in tumor resistance to chemo/radiation therapy and tumor relapse and progression. However, neither their existence nor their identity within many cancers has been well defined. Here, we have demonstrated that CD13 is a marker for semiquiescent CSCs in human liver cancer cell lines and clinical samples and that targeting these cells might provide a way to treat this disease. CD13+ cells predominated in the G0 phase of the cell cycle and typically formed cellular clusters in cancer foci. Following treatment, these cells survived and were enriched along the fibrous capsule where liver cancers usually relapse. Mechanistically, CD13 reduced ROS-induced DNA damage after genotoxic chemo/radiation stress and protected cells from apoptosis. In mouse xenograft models, combination of a CD13 inhibitor and the genotoxic chemotherapeutic fluorouracil (5-FU) drastically reduced tumor volume compared with either agent alone. 5-FU inhibited CD90+ proliferating CSCs, some of which produce CD13+ semiquiescent CSCs, while CD13 inhibition suppressed the self-renewing and tumor-initiating ability of dormant CSCs. Therefore, combining a CD13 inhibitor with a ROS-inducing chemo/radiation therapy may improve the treatment of liver cancer. Citation Information: J Clin Invest. 2010;120(9):3340-3349. https://doi.org/10.1172/JCI43230. Fibroblasts are ubiquitous cells that demonstrate remarkable diversity. However, their origin and pathways of differentiation remain poorly defined. Here, we show that connective tissue growth factor (CTGF; also known as CCN2) is sufficient to induce human bone marrow mesenchymal stem/stromal cells (MSCs) to differentiate into fibroblasts. CTGF-stimulated MSCs lost their surface mesenchymal epitopes, expressed broad fibroblastic hallmarks, and increasingly synthesized collagen type I and tenacin-C. After fibroblastic commitment, the ability of MSCs to differentiate into nonfibroblastic lineages — including osteoblasts, chondrocytes, and adipocytes — was diminished. To address inherent heterogeneity in MSC culture, we established 18 single MSC–derived clones by limiting dilution. CTGF-treated MSCs were α-SMA–, differentiating into α-SMA+ myofibroblasts only when stimulated subsequently with TGF-β1, suggestive of stepwise processes of fibroblast commitment, fibrogenesis, and pathological fibrosis. In rats, in vivo microencapsulated delivery of CTGF prompted postnatal connective tissue to undergo fibrogenesis rather than ectopic mineralization. The knowledge that fibroblasts have a mesenchymal origin may enrich our understanding of organ fibrosis, cancer stroma, ectopic mineralization, scarring, and regeneration. Citation Information: J Clin Invest. 2010;120(9):3350-3364. https://doi.org/10.1172/JCI41080. Inappropriate excess of the steroid hormone aldosterone, which is a mineralocorticoid receptor (MR) agonist, is associated with increased inflammation and risk of cardiovascular disease. MR antagonists are cardioprotective and antiinflammatory in vivo, and evidence suggests that they mediate these effects in part by aldosterone-independent mechanisms. Here we have shown that MR on myeloid cells is necessary for efficient classical macrophage activation by proinflammatory cytokines. Macrophages from mice lacking MR in myeloid cells (referred to herein as MyMRKO mice) exhibited a transcription profile of alternative activation. In vitro, MR deficiency synergized with inducers of alternatively activated macrophages (for example, IL-4 and agonists of PPARγ and the glucocorticoid receptor) to enhance alternative activation. In vivo, MR deficiency in macrophages mimicked the effects of MR antagonists and protected against cardiac hypertrophy, fibrosis, and vascular damage caused by L-NAME/Ang II. Increased blood pressure and heart rates and decreased circadian variation were observed during treatment of MyMRKO mice with L-NAME/Ang II. We conclude that myeloid MR is an important control point in macrophage polarization and that the function of MR on myeloid cells likely represents a conserved ancestral MR function that is integrated in a transcriptional network with PPARγ and glucocorticoid receptor. Furthermore, myeloid MR is critical for blood pressure control and for hypertrophic and fibrotic responses in the mouse heart and aorta. Citation Information: J Clin Invest. 2010;120(9):3365-3376. https://doi.org/10.1172/JCI42796. The hallmark of human Mycobacterium tuberculosis infection is the presence of lung granulomas. Lung granulomas can have different phenotypes, with caseous necrosis and hypoxia present within these structures during active tuberculosis. Production of NO by the inducible host enzyme NOS2 is a key antimycobacterial defense mechanism that requires oxygen as a substrate; it is therefore likely to perform inefficiently in hypoxic regions of granulomas in which M. tuberculosis persists. Here we have used Nos2–/– mice to investigate host-protective mechanisms within hypoxic granulomas and identified a role for host serine proteases in hypoxic granulomas in determining outcome of disease. Nos2–/– mice reproduced human-like granulomas in the lung when infected with M. tuberculosis in the ear dermis. The granulomas were hypoxic and contained large amounts of the serine protease cathepsin G and clade B serine protease inhibitors (serpins). Extrinsic inhibition of serine protease activity in vivo resulted in distorted granuloma structure, extensive hypoxia, and increased bacterial growth in this model. These data suggest that serine protease activity acts as a protective mechanism within hypoxic regions of lung granulomas and present a potential new strategy for the treatment of tuberculosis. Citation Information: J Clin Invest. 2010;120(9):3377-3388. https://doi.org/10.1172/JCI42113. The mechanism of thyroid hormone (TH) secretion from the thyroid gland into blood is unknown. Humans and mice deficient in monocarboxylate transporter 8 (MCT8) have low serum thyroxine (T4) levels that cannot be fully explained by increased deiodination. Here, we have shown that Mct8 is localized at the basolateral membrane of thyrocytes and that the serum TH concentration is reduced in Mct8-KO mice early after being taken off a treatment that almost completely depleted the thyroid gland of TH. Thyroid glands in Mct8-KO mice contained more non-thyroglobulin-associated T4 and triiodothyronine than did those in wild-type mice, independent of deiodination. In addition, depletion of thyroidal TH content was slower during iodine deficiency. After administration of 125I, the rate of both its secretion from the thyroid gland and its appearance in the serum as trichloroacetic acid–precipitable radioactivity was greatly reduced in Mct8-KO mice. Similarly, the secretion of T4 induced by injection of thyrotropin was reduced in Mct8-KO in which endogenous TSH and T4 were suppressed by administration of triiodothyronine. To our knowledge, this study is the first to demonstrate that Mct8 is involved in the secretion of TH from the thyroid gland and contributes, in part, to the low serum T4 level observed in MCT8-deficient patients. Citation Information: J Clin Invest. 2010;120(9):3389-3400. https://doi.org/10.1172/JCI43350. Translational control plays a key role in late spermiogenesis. A number of mRNAs encoding proteins required for late spermiogenesis are expressed in early spermatids but are stored as translationally inactive messenger ribonucleoprotein particles (mRNPs). The translation of these mRNAs is associated with shortening of their poly(A) tail in late spermiogenesis. Poly(A)-binding protein (Pabp) plays an important role in mRNA stabilization and translation. Three Pabp-interacting proteins, Paip1, Paip2a, and Paip2b, have been described. Paip2a is expressed in late spermatids. To investigate the role of Paip2 in spermiogenesis, we generated mice with knockout of either Paip2a or Paip2b and double-KO (DKO) mice lacking both Paip2a and Paip2b. Paip2a-KO and Paip2a/Paip2b-DKO mice exhibited male infertility. Translation of several mRNAs encoding proteins essential to male germ cell development was inhibited in late spermiogenesis in Paip2a/Paip2b-DKO mice, resulting in defective elongated spermatids. Inhibition of translation in Paip2a/Paip2b-DKO mice was caused by aberrant increased expression of Pabp, which impaired the interaction between eukaryotic initiation factor 4E (eIF4E) and the cap structure at the 5′ end of the mRNA. We therefore propose a model whereby efficient mRNA translation in late spermiogenesis occurs at an optimal concentration of Pabp, a condition not fulfilled in Paip2a/Paip2b-DKO mice. Citation Information: J Clin Invest. 2010;120(9):3401-3401. https://doi.org/10.1172/JCI8707R1.